What Kind Of Grass Seed Should I Plant? Years ago Scotts ran a magazine ad with the headline: “How I Saved $9.00 and Ruined My Lawn!” The ad showed a picture of a lawn full of the kind of clumpy grassy weeds that are hard to control. Cheap seed often is contaminated with seeds from those kinds of grassy weeds because they are growing in the field alongside the good grass plants. The grass seed farmer has to decide whether to go to the extra expense of getting rid of these weeds or to sell his seed for less because of the weed seed contamination. Scotts pays grass seed farmers top dollar to get weed free seed. The ad’s message: “cheap seed is going to cost you in the long run. So, if you want the best grass seed you can get, here’s your choice: We put our best grass varieties into Scotts Turf Builder Grass Seed Products and in the Scotts EZ Seed Grass Seed Products (great for bare spot repair). So how do you figure out which Turf Builder Grass Seed Mix is right for you? You simply select the mix that matches your conditions: sun, shade, mix of sun and shade, high traffic, heat-tolerance, etc. That’s what I did several years ago when we lived in Ohio in a new lawn area that I knew I would never be able to water after the grass became established. (I was able to keep it watered to get the grass seed going.) I planted Scotts Turf Builder Heat-Tolerant Blue Grass Seed. This mix contains three turf-type tall fescues along with Scotts exclusive Thermal Kentucky Bluegrass. The bluegrass provides spreading capability (new plants from existing plants) that you don’t get with tall fescues. This also helps with disease resistance and recovery. 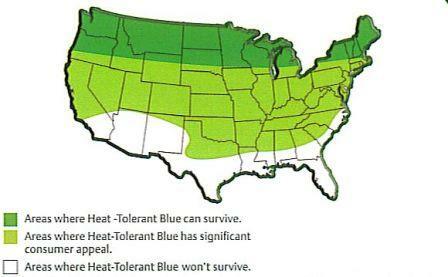 Thermal Blue is not just any old bluegrass. The plant breeders were after heat and drought tolerance when they developed it. I have had good experience with this grass seed in both Ohio and Georgia. Ashton – How important is it for the seed bag to contain 0.00% Other Crop and 0.00% Weed Seed? Weed seed is bad, Other Crop seed can be worse. Get as close as you can to 0% on both. You may not be able to get to 0.00%, so you need to trust the company that sells the seed that any “bad stuff” that is counted in these two catagories is not something that is going to ruin your lawn.